Bike Rentals at Lahaina bike shop. Riding a bike on Maui offers many advantages over the typical car rental experience most visitors undertake. With new mountain bike trails being built and more designated bike lanes on more roads, the opportunity to go cycling on Maui should not be missed. Regardless of being a casual cyclist looking to cruise to the beach, an extreme mountain bike rider looking for adrenaline inducing trails or a weekend warrior training for their next century ride, riding a bike on Maui is a must do activity! Why Maui is Better From the Seat of Bicycle! Family cycling on Maui in Paia. Easier to See More Biking on Maui – Exploring Maui by bicycle puts the rider in touch with the scenery at a slower pace and without the distractions of driving. Maui visitors returning their bike rentals to our shop in Lahaina frequently tell us they are astounded at how much more they saw while touring Maui by bicycle. Even frequent returning visitors exclaim the flowers smell better and we were closer to nature on a bike. Stay Healthy and Have Fun on Vacation – Being active during a vacation will help you maintain your fitness routine while vacationing on Maui. Riding a bike is a great way to get exercise on vacation. We all want to slow down during our vacation. But, that doesn’t mean we need to stop exercising or break our fitness routines. Get on a road bike to explore Maui or cycle around the entire island! Mountain bikers have every type of trail ride available on Maui! From cool tree lined shady upcountry trails in the Makawao Forest Reserve on the slopes of Haleakala to the dry single track trails in West Maui and South Maui, jump on a rental mountain bike and get away from it all! Join our Sunday afternoon shop ride to find out about mountain bike trails in West Maui. 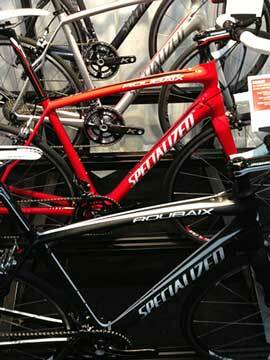 Specialized bicycle rentals on Maui. Easy Parking for Bicycles – If you are on a bike, no need to drive around Lahaina wasting time looking for a parking space for the rental car before you go to dinner. A cruiser bike rental from West Maui Cycles is perfect to explore Lahaina or Kaanapali and the other West Maui resort areas. Just find one of the many racks available and lock up your bike rental. We include a lock and cable with all bike rentals. Less Traffic Hassles – Though Maui certainly has less traffic than visitors encounter while cycling at home, the smaller roads can still create traffic delays due to construction or accidents. You’ll be happy you are a rental bike when traffic backs up as you zip by onto your next destination! Most Maui roads have paved shoulders for bike riding and many have designated bike lanes for cycling. Try the Latest Bicycles - Thinking about getting a new bicycle? Lots of visiting cyclists use their cycling vacation to experience a few different bikes for the purpose of narrowing their choice. Others want to spend an expanded length of time on the bike they’ve decided on just before they make the final purchase. Our rental bike fleet includes several Specialized bicycle models. Maybe you’ll even want to purchase the rental bike and ship it home with you to ride forever! New or used, you can buy a bike on Maui at West Maui Cycles!